There are a number of reasons why balance declines over the years. It’s something that largely declines with age. One of the reasons is fear. Fear grows with age and it’s one of the main reasons why our balance gets worse. Think back to when you were 10 years younger than you are now or even 10 years old. You probably didn’t think as much (or even think twice) about participating in actives that made you challenge your balance. You would flip, run, jump and play without thinking about the fact that you might get hurt. As we get older, we stop to think about the consequences of certain movements and actions. We could get hurt if we run and jump or attempt that flip. As a result, we stop challenging ourselves in certain physical ways and our mind body connection declines leading to the reduced ability to balance. Working on balance and coordination is so important especially in the aging process so that you can maintain confidence in your own balance and strength and throughout your body. In order to address balance as a whole, we’ll cover which outside factors affect your balance negatively, which physical factors lead to a decline in balance and finally what you can do to improve your balance and coordination. Age. We don’t challenge our balance like we did when we were younger. As I mentioned above, as we age, we get fearful of getting hurt so we neglect to do actives that challenge our balance. Time. Another reason we don’t challenge our balance as much is the simple fact that we don’t have time for some or all of those fun activities. As we get further and further into life, we get busier, have more responsibilities and not enough time to devote to sports and other activities that might help our bodies with balance. Finished Surfaces. Another big reason leading to a decline in our balance is that we walk on finished surfaces the majority of the time. Hundreds of years ago when we had to walk on uneven earth to travel or to visit a friend, to work or to go into town, we were improving our foot and ankle strength just by walking on this uneven ground. Today, we walk on finish sidewalks, paved roads, hardwood floors and marble floors. We rarely get the chance to challenge our balance in this way. Lack Of Variety In Movements. Often times when we workout, we tend to do the same things. We gravitate to what we know so we do the same movements, go to the same classes or jump on the treadmill because it’s familiar and easy. The only problem is that not mixing up your movements means you’re doing the same things all of the time and therefore not challenging your brain or your body. Foot & Ankle Strength. As I mentioned above, we rarely walk on unfinished surfaces. This leads to weaker foot, ankle and lower leg strength. One of the biggest reasons why we “roll” an ankle is because of weakness. Overall balance is impacted with weakness in the lower leg. Core Strength. Core strength is another factor affecting balance negatively. Without a strong foundation of the mid section, almost all of your body is naturally weaker. Your core helps you maintain proper posture which in turn trickles to every other part of your body. Mind Body Connection. I’m sure you’ve heard people talk about the mind body connection and wondered what exactly they were talking about. The mind body connection refers to your brain’s ability to fire the right neurons in order to tell your body what to do. If you’re not moving in certain ways, moving in different ways or challenging your body in general, you most likely aren’t refining or developing the mind body connection as well as you should be. Simply put – your brain doesn’t know how to tell your body to move as well as it should or could. Moving In Different Directions. In life we generally just go forward. Unless you have an activity or sport in your life that has you moving in different directions, I can almost bet that the majority of the time you only move forward. We rarely go backwards, we don’t often twist and we usually don’t go side to side unless prompted. This lack of directional movement goes hand in hand with poor balance because of the mind body connection. Walk On Unfinished Surfaces Intentionally – Walking or moving on unfinished surfaces is a fantastic benefit for balance and the mind body connection. Activities like hiking through the woods or trails, running in the grass rather than on the sidewalk or even walking on the grass rather than the sidewalk are great places to start. Getting in your walks or workouts at the beach if possible or even participating in other activities like skiing or snowboarding or cross country skiing are other beneficial ways that you can take your body to an uneven area and challenge your balance. Add Elements Into Your Home That Will Challenge Your Balance. Having different surfaces and levels will help to challenge balance. Adding in textured rugs like a cobble stone rug underneath your bathroom sink or even a seagrass rug are great ways to make sure you’re walking on different surfaces so your brain has to think about the mind-body connection. Add Simple Balance Movements Into Every Day Life. Standing on 1 foot while you do the dishes or brush your teeth is a fantastic way to challenge your balance. Plus, you don’t need any special equipment to practice! Doing simple movements like walking heel to toe as if you’re on a balance beam is another way that you can improve balance. 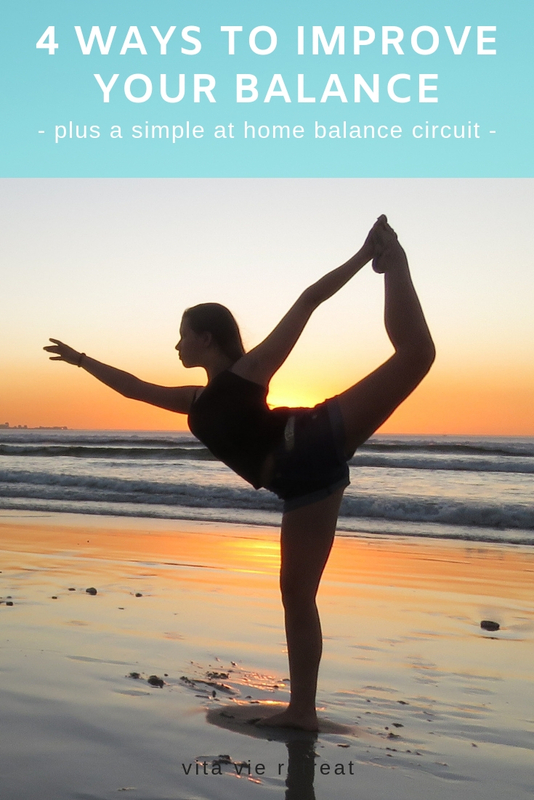 Walk on your toes or your heels for 30 seconds at a time is another example of easy at home balance training. One legged movements like squats and lunges so you have to challenge each side of your body separately are awesome for balance. Plus, they’ll help develop core strength and lower leg strength. Balance apparatuses such as stability discs (our favorite) or the bosu ball are also good ways to challenge balance while standing on them during workouts. *Check with your local fitness professional or sign up for our online personal training if you need guidance. Mix it up. One of the worst things we do as a whole when it comes to working out is we do the same things over and over again. Mix up your movements at least once per week. If you’re not sure how, set up an appointment with a trainer or our online coaching or even try a new class to get ideas. Make sure you’re moving in different ways so that your body never gets used to what you’re doing. Try an activity like yoga or martial arts that incorporates balancing movements. *Repeat circuit 2 – 3 times in a row. Do 2 to 3 times each week. In order to improve your balance, you’ve got to challenge your body and your mind. Move in different ways that strengthen your body physically. If you need personalized guidance, check out our Health & Wellness Coaching or sign up for one of our fitness retreats to get a jumpstart on your balance and healthy habits. If you have questions or comments about this blog post, please leave them in the comment section below.